Photograph of Springfield Hospital and Training School with accompanying information. 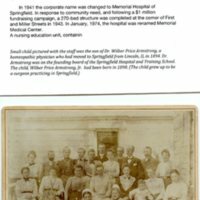 The photo is accompanied by a short excerpt explaining the founding and expansion of the Springfield Hospital and Training School. This hospital would later become Memorial Medical Center.